HomestaysUSA aims to provide a positive intercultural and linguistic experience by placing Spanish students in American host families. We strive to give the Spanish students an immersion experience through living in a warm and open household that allows them to improve their knowledge of English and of America and at the same time give the host family the chance to experience a different culture and represent their own country. To achieve this, we carefully search for and only select host families that come through our personal contacts and references. We always match the student with an American “host brother” or “host sister”, a family member of the same gender and close in age. We also do our best to match their interests and hobbies in hopes of forming a strong, interactive relationship. 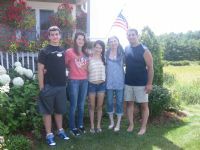 While living in a host family can be an amazing and beneficial experience, it can sometimes be difficult and challenging. We aim to make it easier for both the Spanish and the American families by organizing everything from start to finish: We profile and prepare both families and students beforehand, match them appropriately, make all travel arrangements, accompany the students on the trip there and back, and maintain contact with them, including a personal house visit. We are always close by and contactable before, during or after the stay for any type of question or concern.